Cusco is loaded with interesting things to see. One of these sites is the San Pedro Market (Mercado Central de San Pedro). Not only is it popular with the locals, it’s also a popular place for tourists to visit. Don’t miss an opportunity to visit, it’s located only a few blocks from the main square, Plaza de Armas, besides the San Pedro Church. What you can find in San Pedro Market? Almost anything! Textiles, souvenirs, food, fruits, vegetables, herbs and other medicinal products. One end of the market also houses dozens of eateries serving local dishes at low prices. Meals usually consist of a soup, a main, and a drink; for about 6 Soles. One of the most popular sections is the isle of fresh juice stalls. 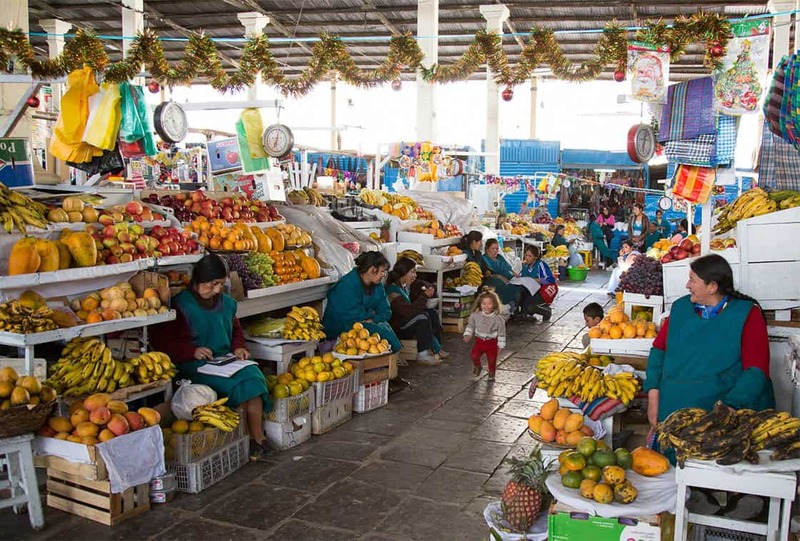 Every day, energetic Peruvian women prepare delicious fruit and vegetable juices and try to attract passersby to their respective stalls – there is certainly a lot of competition! Customers can choose additives like yogurt or sweetners. Three glasses of juice will only set you back 4 Soles! Fresh juice at San Pedro offers not only a great dose of vitamins but also a breakfast alternative. It’s also the perfect spot to meet friends, hang out, and relax. You could also make friends with some locals and learn a thing or two about Peruvians! If you are interested in what else you can find in San Pedro market, check out the article: Where you can find centro naturista in Peru.